Assorted Berry Flavors: cherry, strawberry and wildberry. Most fiber, most calcium, most vitamin D per tablet. Why are fiber & calcium important parts of a healthy diet? 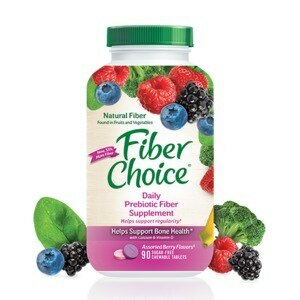 You already know that fiber helps to maintain regularity and digestive health, but did you know that FiberChoice Plus Calcium+D can also help: boost calcium absorption; build and maintain healthy bones; promote good digestive health; control and maintain a healthy weight; maintain your immune system to keep you healthy. Did you know nutrition experts recommend that the average American, including adolescents, consume 25 to 30 grams of dietary fiber every day. Yet most off us get only about half that amount! FiberChoice. The smart choice. FiberChoice Plus Calcium+D is the best supplement choice to close that daily fiber and calcium gap easily and naturally. One serving of two chewable tablets (no water required) contains 4 g of inulin fiber, plus 500 mg of calcium, plus 200 IU of Vitamin D. Inulin not only tastes great and has better consistency, it also helps boost calcium absorption [Evidence suggests that 8 grams per day of inulin (a natural dietary fiber) increases calcium absorption. Each serving of FiberChoice contains 4 grams of inulin]. Tablets main contain dark speckles due to the manufacturing process of natural ingredients. Most fiber, most calcium, most vitamin D per tablet = best value per bottle. Compare for yourself. FiberChoice: 2.0 g of fiber, 250 mg of calcium, 100 IU of vitamin D. 90 tablets: 180 g of fiber per bottle, 22,500 mg of calcium per bottle, 9,000 IU of vitamin D per bottle. Metamucil: 06 g of fiber, 60 mg of calcium, 0 IU of vitamin D. 120 capsules: 72 g of fiber per bottle, 7,200 mg of calcium per bottle. (These statements have not been evaluated by the Food and Drug Administration. This product is not intended to diagnose, treat, cure or prevent any disease). Inulin (a Natural Vegetable Fiber), Sorbitol, Calcium Carbonate, Citric Acid, Magnesium Stearate, Artificial Flavors, FD&C Red 40 Aluminum Lake, FD&C Blue 2 Aluminum Lake, Cholecalciferol (Vitamin D3). Adults: Chew 2 tablets per day (no water required). If minor gas or bloating occurs, temporarily reduce daily serving. 6 Yrs to Adult: 2 tablets (not to exceed 4 tablets per day) (4 g fiber, 500 mg calcium, 200 IU vitamin D). Children Under 6 Yrs: Consult your doctor. Store below 30 degrees C (86 degrees F). Keep the container tightly closed. Keep out of reach of children. Safety Sealed: Do not use if inner seal beneath the cap is missing or broken.